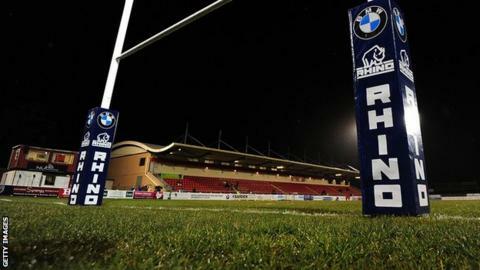 Plymouth Albion have been taken over by two of their former players after entering administration. David Venables and Bruce Priday played together for the club and have taken ownership of the National One club. However, having entered administration on Friday, the Devon side have been docked 30 points by the RFU. "We have serious plans to develop an infrastructure and team that can play at the highest level," the pair said in a joint statement. "We intend to run a club that will be ambitious, but fun, and one that clings strongly to its roots and traditions." Albion's win against Wharfedale means they are guaranteed to stay in the third tier despite the points deduction, which leaves them in 10th. It is the second time that the club has been taken over in just over a year, with chairman Peter Vosper unable to turn their finances around, despite saying that they were 'more stable' in February. Vosper became chairman in February 2015 after the club announced its intention to appoint an administrator the month before. "We have become involved because we want the club to thrive and Plymouth deserves to have a top-flight professional rugby team," added Venables and Priday, who represented Albion in the 1980s. "We intend on listening to opinions from all sources, including the loyal support who have stuck with and helped the club through difficult times." The pair received interim approval from the RFU and Devon RFU to take over the club's assets late on Friday, and have pledged to build "a club that is run on a sound, sustainable financial basis."